Unlike baked cheesecakes, this no bake cheesecake recipe is so easy and quick to make. An easy no bake cheesecake recipe you can easily put together just before serving. Alternatively, make earlier and leave in the fridge until you are ready to impress your guests! 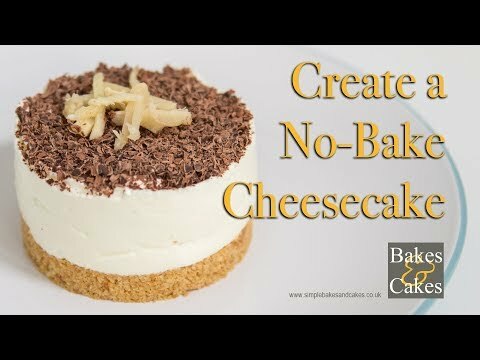 With this easy no bake cheesecake recipe you will need to use full fat cream cheese as this helps the structure stay in place without it sliding off the biscuit base. It originally comes from James Martin’s cook book called Desserts and it really is a lovely cheesecake to make. Watch the video to learn how to create this easy no bake James Martin ginger cheesecake recipe. Crush biscuits into crumbs using either a processor or rolling pin. Heat the butter and mix in the biscuit crumbs. Pour into a steel ring and squash down to form the cheesecake base. Whisk the cream cheese to soften it up and add the ginger pieces and juice. Pour into the steel ring and level off. Decorate with a few ginger shreds. Remove steel ring and serve. Try this no bake cheesecake and see what you think, then let me know in the comments section below. Also, if you’re looking for a no bake mocha cheesecake there is one here to have a go at, alternatively a great cheesecake lemon recipe is a real zinger! If you like chocolate brownies, they are simple and easy to bake but taste superb, here’s Mary Berry’s recipe. Makes 2 x 7cm servings. Simplebakesandcakes.co.uk is a participant in the Amazon Services LLC Associates Program, and affiliate advertising program designed to provide a means for sites to earn advertising fees by advertising and linking to Amazon.co.uk.